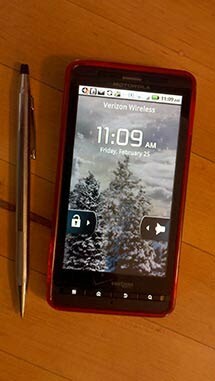 This blog is intended as a means to celebrate the available droid apps and widgets through both praise and criticism. I have found the android smartphone platform a perfect compliment to my Windows and Mac computers, as well as an enhancement to my daily life. I just love what the android can do! Because of this impact I believe that small handheld smart device worldwide web usability & visibility are vital skils for graphic web designers such as myself. If you have ever wanted a Business Card Reader (BCR), I just bet that it would have to be something handy. This is one of those cases where, if you were offered a program that you would install on your computer that would scan in business cards, you probably wouldn't even bother with it unless it was free, am I right? Well, the reason is simple, it just isn't convenient. Having to take a business card home and scan it in just to have it available with all its contact information is actually more like a huge chore. But now-a-days we are all walking around with smartphones and finally, the convenience we require is available as a little app for our Android or iPhone! Check out my article which covers the Android based version of the CamCard - BCR (western) which I absolutely love on My DroidX. But note that there is also a version for the asian market (Chinese/Japanese/Korean characters), another version for business, and that there are also alternate versions of each for the iPhone market as well. With the convenience of hand held devices, the Business Card Reader has finally become a reliable and useful reality. If the pen is mightier than the sword will my DroidX be getting a laser gun app soon? Target: Page 1 in the US!